Published: Mar 26, 2018 · Modified: Apr 11, 2019 · By Jen Sobjack · This post may contain affiliate links. 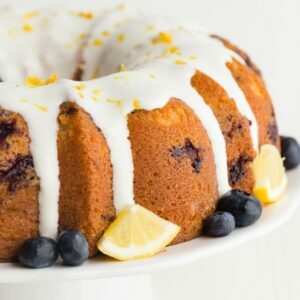 This Lemon Blueberry Bundt Cake made completely from scratch has taken the classic lemon bundt cake and speckled it with fresh blueberries then topped the whole cake off with lemon cream cheese glaze. Perfect for spring get-togethers. I can’t believe some of you got hit with more snow last week! Just in case you are sick of the dreary winter weather, here’s a little something to brighten your day. Happy spring! Vanilla cupcakes with lemon cream cheese frosting. Lemon cream cheese scones with strawberries. Easiest raspberry lemon crescent rolls. Lemon thumbprint cookies. It’s undeniable that I love lemon and all the spring flavor combinations. Oh hey, you gorgeous blueberry lemon icebox cake. 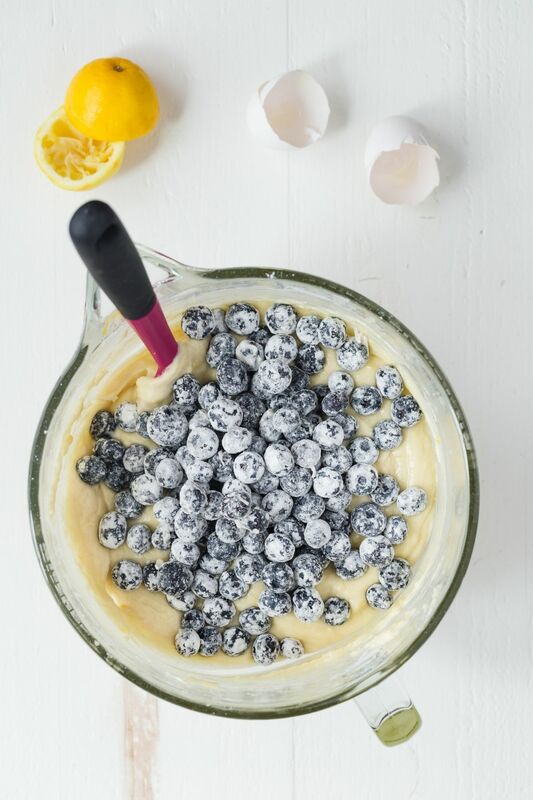 There’s simply no doubt that lemon and blueberry were made for each other. It’s one of my top flavor duos of all time. 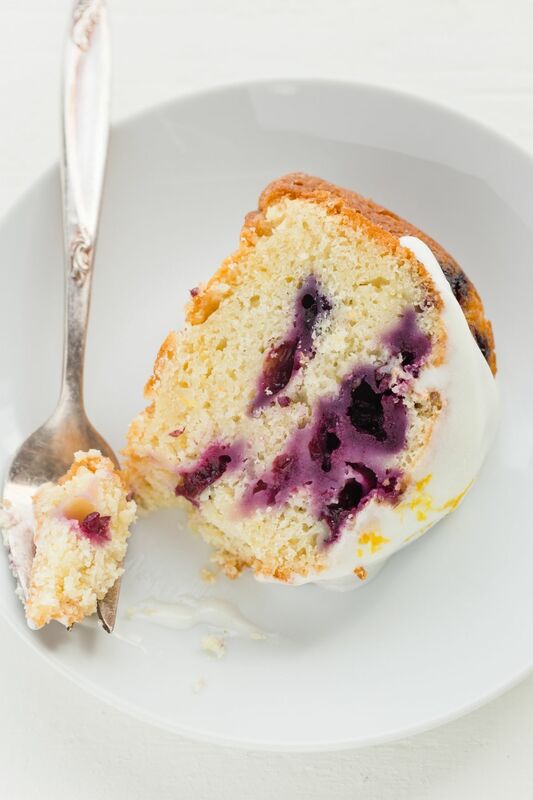 Today I’m sharing a super-moist glazed lemon bundt cake that’s speckled with fresh blueberries. It’s the ultimate spring cake! It’s a basic lemon bundt cake that’s adapted from my oh-so-pretty tequila sunrise cake. Do you remember that cake? It’s a couple years old now but it’s always a hit when I share it on facebook. I like to make this cake for dinner parties because it’s such a show-stopper with minimal effort. It’s supremely buttery and moist. So good, you guys! With a dense texture without feeling too heavy, this cake is perfect for all sorts of options. 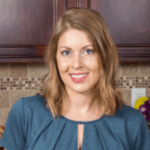 So here I am with a fun zesty spin on my favorite bundt cake. Creamed butter and sugar is the start of the bundt cake. Use regular granulated sugar and unsalted butter. The moisture comes from 3 large eggs, and egg yolk, fresh lemon juice, oil, and plain Greek yogurt. Lemon zest and a dash of vanilla extract flavor the cake. I suggest zesting the lemons then slice them open and use the fresh juice. Please don’t use store-bought lemon juice. Fresh is so much brighter in flavor. For the blueberries, you can go with fresh, frozen, or even dried, I tested the cake with both fresh and frozen blueberries! If you decide to use frozen, there’s no need to thaw them. And take care when mixing them into the batter because they can turn the batter a purple color or leave purple streaks. Dried blueberries work well also. 2 cups of dried blueberries is the magic amount without being overwhelming. When using fresh blueberries, I like to toss them in a little flour before adding them to the batter. This helps keep them from “sinking” to the bottom of the batter. I love to top my bundt cakes with a matching glaze. In this case, I used a lemon glaze. Cream cheese makes it tangy, confectioners’ sugar adds sweetness, and lemon juice adds a little more tang that’s super pleasant on the tongue. I usually include some zest as well. 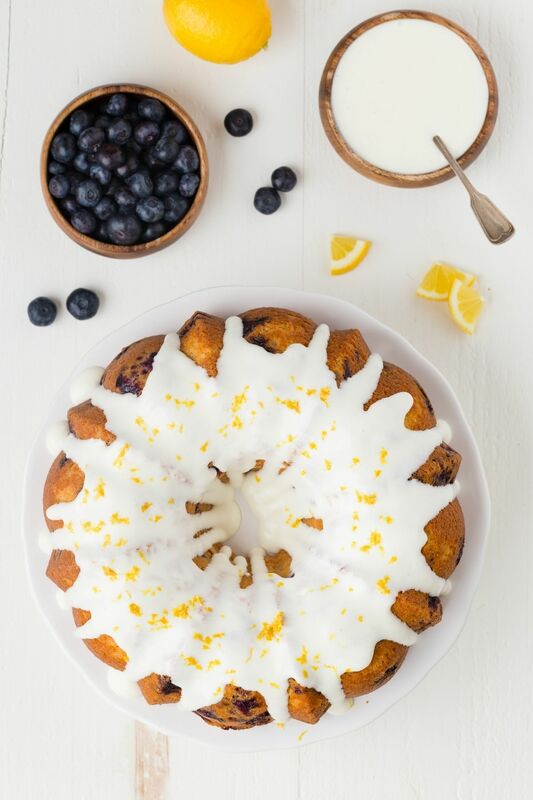 Decorate the lemon blueberry bundt cake with fresh lemon slices and blueberries. Just look at how pretty this presentation is! What bundt pan to use for cakes? I use the same bundt pan every time I make a bundt cake. It has never failed me. I like that it has a nonstick coating but I still use cake release for added insurance. The bundt cake slides right out of the pan when I invert it. The wet ingredients will look a bit curdled before adding the dry ingredients. This happens almost anytime I use citrus juice in my batter. It’s perfectly okay and everything will blend together beautifully after you add the last addition of dry ingredients. 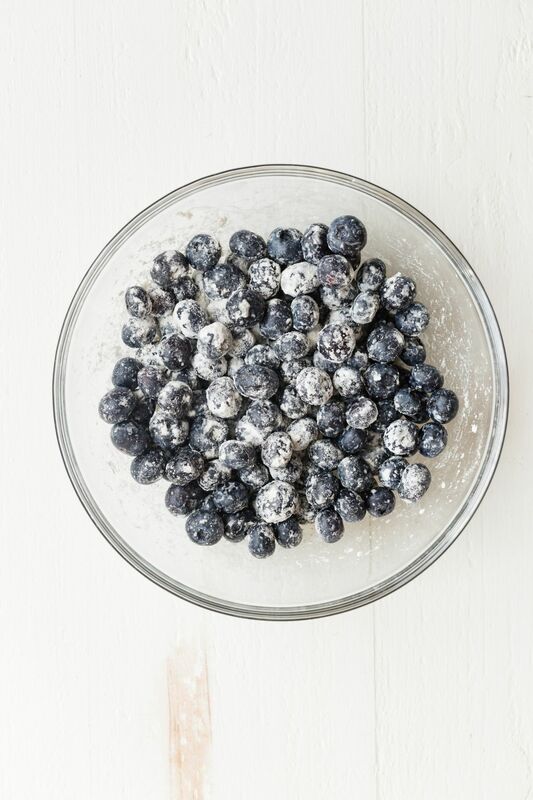 Toss the blueberries in a little bit of flour before adding them to the batter. This will help keep them from sinking to the bottom. 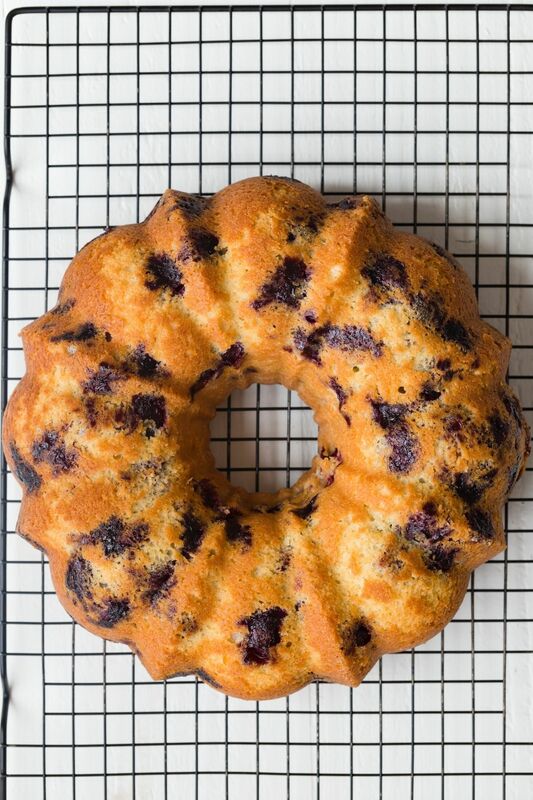 You can use fresh, frozen, or dried blueberries in this bundt cake. I’ve left instructions in the notes portion of the recipe. Set all the ingredients out 30 minutes prior to making the bundt cake. This is to ensure that your cold ingredients have had time to come to room temperature. Preheat the oven to 350°F. 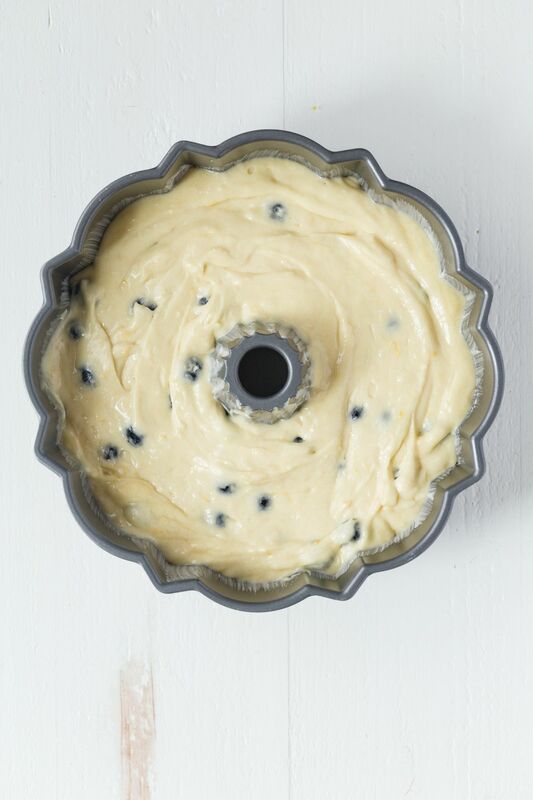 Lightly grease and flour a 10-cup bundt pan; set aside. Combine the blueberries and 1 tablespoon of flour in a bowl. Toss gently to evenly coat the berries then set aside. In the bowl of a stand mixer fitted with a paddle attachment or with a handheld electric mixer, beat the butter and sugar together until light and fluffy, about 5 minutes. Beat in the eggs and egg yolk, one at a time, mixing well after each addition. Beat in the vanilla and lemon zest followed by the lemon juice and oil. In a separate bowl whisk together the remaining 3 cups of flour, baking powder, baking soda, and salt. Add to the butter mixture in three additions, alternating with yogurt, mixing well after each addition. Take care not to over mix the batter. Gently fold in the blueberries using a rubber spatula until just combined. Spread the batter evenly into the prepared pan and bake for 50-65 minutes or until a toothpick inserted into the bottom comes out clean. Tent loosely with foil if the cake begins to get too brown before the center has baked through. Remove from oven and cool in the pan on a wire rack for 15 minutes then invert the cake onto the rack to cool completely. In a mixing bowl, beat the cream cheese with an electric mixer until smooth. Beat in the confectioners’ sugar and lemon zest until well combined. Beat in enough lemon juice to make a pourable glaze. 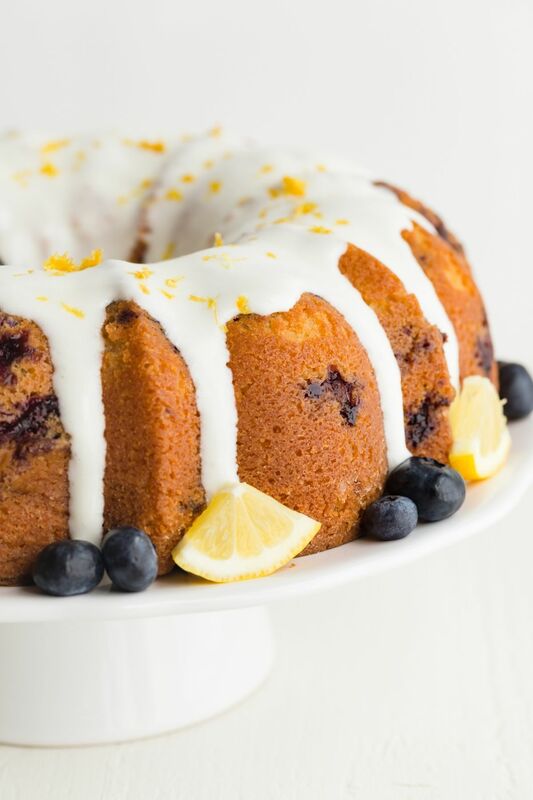 Drizzle the glaze over the cake then garnish with fresh blueberries and lemon slices if desired. Glazed cake can be covered tightly and stored at room temperature for 2 days and/or in the refrigerator for up to 5 days. Unglazed cake can be covered tightly and refrigerated for up to 2 days before serving. Bring to room temperate, glaze, and serve. Unglazed cake can be frozen for up to 3 months. Thaw in the refrigerator overnight and bring to room temperature just before serving. Glaze and serve. *2 cups of fresh, frozen, or dried blueberries will work. Do not thaw if using frozen blueberries. *Sour cream can be used in place of Greek yogurt. *Use fresh lemon juice. You’ll be using lemon zest anyway, so juice those lemons.